Exploding box greeting cards have been trendy in the crafting world for several years. If you're one of those people wondering what a DIY exploding box is, rest assured it's much more harmless than it sounds. The term is used to describe paper box greeting cards that been created so that the sides cascade outwards as the lid is removed. These creative cards are a fun and innovative way to personalize a birthday gift, an anniversary gift, or even boxes for wedding favors. Just change the color and theme of the paper or cardstock used to create them. These box cards are perfect for any occasion. Since this is a DIY craft, you can customize this exploding box any which way you'd like. For instance, you can try adding some rubber stamped tags with a special message, attach decorative embellishments, add keepsakes or mementos, or get creative with the presents you're gifting. If you are feeling exceptionally crafty, make a tiny box that holds the recipient's present and attach it to the center of the box. Make sure to use thicker paper when making this project. If you're looking for an even more robust structure, we recommend using a thicker cardstock or chipboard. No matter which type of material you decide upon, it is a good idea to practice first using scrap paper before moving onto good quality paper or cardstock. To make this even simpler, try printing and practicing on a template. 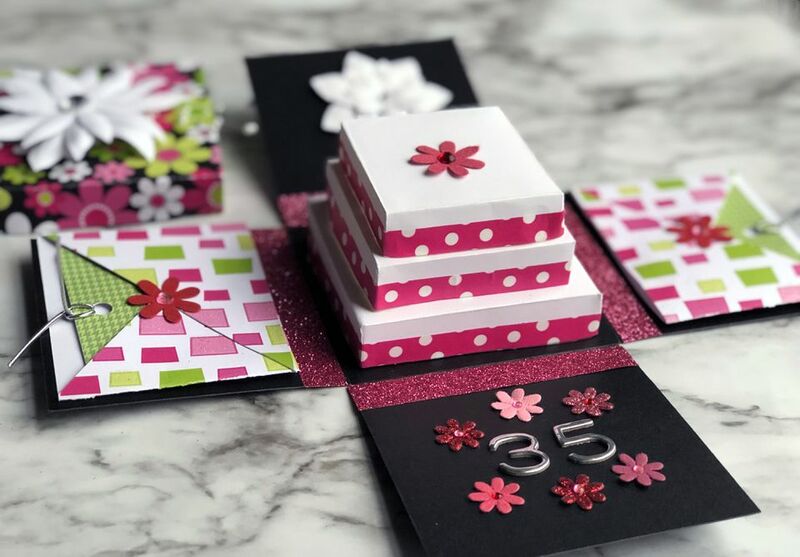 Now that you know a little bit about the DIY exploding box and have some ideas for what types of gifts you can use it for, you will want to get to work on creating this lovely card craft. We are making a simple example exploding box card using only one layer, but you can add as many layers to the card as you wish. Start by printing out the templates for the various sized boxes you'd like to use and transferring them to scrap paper to practice with first. If you've decided not to use a template, use your own measurements and create your own template directly on the scrap paper. Just remember, since exploding boxes are cascading boxes, you'll need to create a few templates of varying sizes: small, medium, and large. Once you have a good idea of how the pieces need to be laid out, cut, and folded, the next step is to trace your patterns onto the cardstock or thick paper. To avoid wasting your expensive paper, print the templates onto scrap paper and place them onto the cardstock to make the most efficient use of space. After you have the templates traced onto the cardstock, cut out the exploding box pieces. Decide which embellishments are going to use for your card. Feel free to make different designs, press on stamps, or write messages on the sides of the different sized boxes that you've cut out. You are only limited by your imagination. Before finishing the box, add any additional final elements to customize and personalize your greeting card box. We added some small gift tags and envelopes to contain individual messages. We also attached a tiny gift box in the shape of a paper cake that we made in a coordinating colored paper to hold a small gift. If you decide to do something similar, use double-sided adhesive tape to attach the tiny gift box to the base of the exploding box. After you've attached your embellishments with glue and tape, fold the sides of the card box back as shown on the template. Make crisp and definite folds, as this will ensure that the sides cascade outwards effectively. Once you've created your simple base or have decided to have various sized boxes, it's time to create the lid. Add any special attachments or embellishments to the lid of the box before folding it. Leave a 1/8-inch to 1/4-inch space around the perimeter of the box top. You can learn how to make boxes with lids here. To finish the box, simply tuck the base into the lid. When the lid is removed from the box, the sides will cascade outwards on their own. Happy crafting!